The Standard Chartered Hong Kong Marathon is one of the territory's most anticipated sporting events that has grown from its humble beginnings in 1997 with a mere 1,000 participants to a signature world-class event with 74,000 runners from over 90 countries competing on this iconic race that unfolds against the backdrop of our breathtaking skyline and harbour. 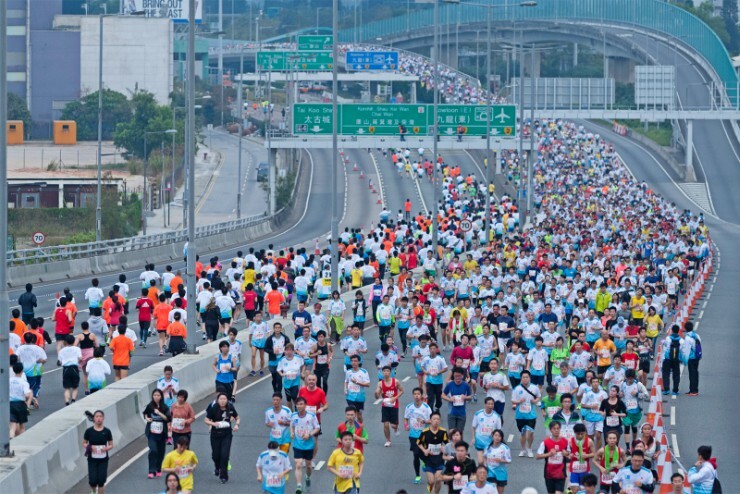 The Hong Kong Marathon has been awarded Gold Label status since the 2016 marathon and with total prize money of US$300,000 it is one of Asia's most prominent marathons. 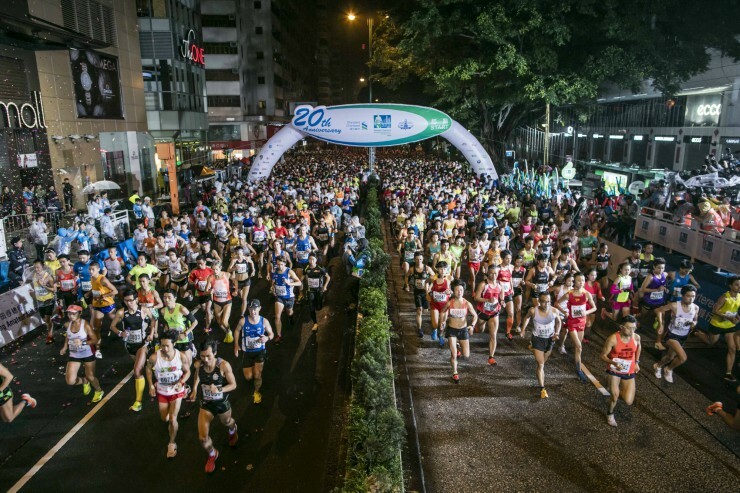 The 42 km route is a tough one involving more than 100 metres in elevation ranging from 70 meters above sea level at the top of the bridges to 30 metres below sea level at the Western Harbour Tunnel and in addition, runners have the high humidity to contend with. The route takes the runners through two bridges, three tunnels and two highways. The start line is in Nathan Road and Kimberley Road in Tsim Sha Tsui next to the Mira Hotel accross from Kowloon Park. The start zone and warm up zone is south from here along Nathan Road, followed by the waiting zones and bagagge deposit areas near the HK Cultural Centre, the Sheraton Hotel and the Peninsula. The course takes you from the heart of Tsim Sha Tsui and bustling Mongkok to the vastness of the New Territories, over two magnificent bridges, Stonecutters Bridge and Ting Kau Bridge, with awesome views of the islands and harbour, and then doublebacks and heads under the Western Cross-Harbour Tunnel to rise up to the majestic Hong Kong skyline and ending in Victoria Park in Causeway Bay. 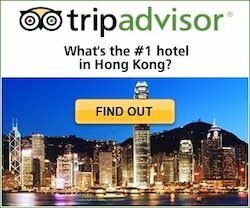 Where to Watch The Hong Kong Marathon? If you want to watch near the start or finish areas, this is where that thrilling air of excitement and expectation is at its peak, but also where the crowds concentrate. To watch them near the start line you will have to be an early bird. Runners will be arriving before their start times of 6:10 am to 7:00 am, they will be assembling and warming up along Nathan Road south of the start point of the race. The Western Harbour Tunnel Toll Plaza, by the bus stop, right before they reach the Hong Kong side. The Public Viewing area set up at Victoria Park, entrance is through Gate 4, where you can watch the runners cross the finish line, but as you can expect, this area will be VERY crowded. 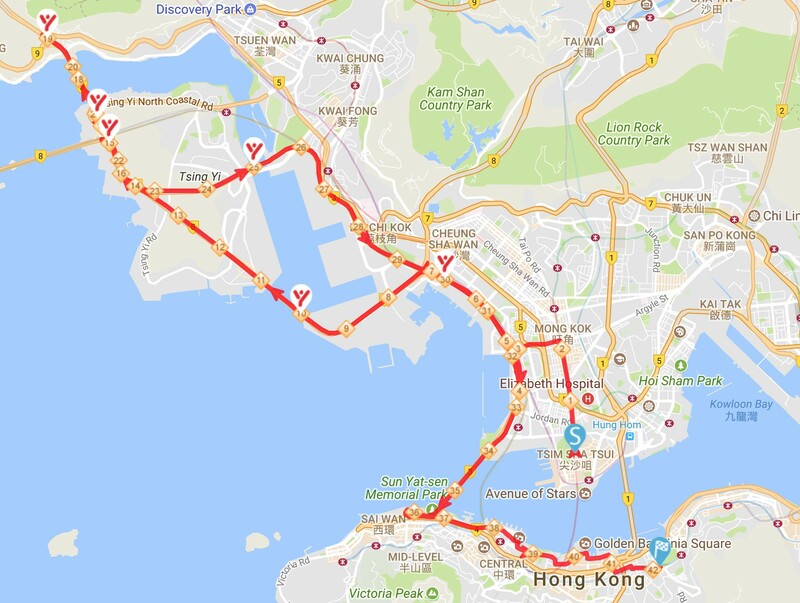 You can choose to stay near the start in Tsim Sha Tsui or the end in Causeway Bay near Victoria Park, or anywhere in between as transportation in the city is quite efficient. In addition, on Race Day special arrangements are made with public transport service providers for earlier start hours, i.e. some MTR lines start running around 3:30 am 4:00 am with trains operating in 8 - 15 minute intervals. Similar arrangement is made for buses. How Much: FREE for spectators! More Info: www.hkmarathon.com/ and download the app for the latest on this year's course route, start times, set ups at start and finish lines, etc.